On this look around the Air Force Chief of Staff of the Air Force, Gen. David Goldfein speaks at the 2017 Thanks USA Supporting our Troops Gala, and the Air Force continues to support recovery efforts in Puerto Rico. 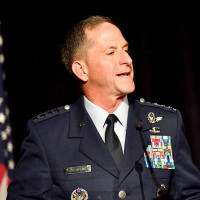 Chief of Staff of the Air Force Gen. David L. Goldfein addressed the importance of taking care of Airmen and their families during the 2017 ThanksUSA Treasure our Troops Gala in Washington, D.C., Oct. 25, 2017. 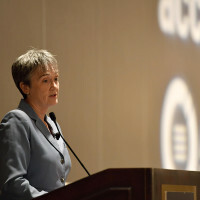 Secretary of the Air Force Heather Wilson addressed the importance of the Air Force’s space mission during the 2017 Potomac Officers Club Space Innovations, Programs and Policies Summit in Washington, D.C., Oct. 18, 2017. 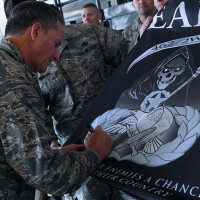 On this look around the Air Force, Puerto Rico relief efforts continue and a group of spouses from Nellis Air Force Base teamed up to help Las Vegas mass shooting victims and their families. 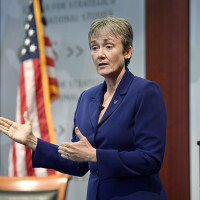 Secretary of the Air Force Heather Wilson spoke about the importance of modernization and innovation in space during a Center for Strategic and International Studies forum in Washington, D.C., Oct. 5, 2017.